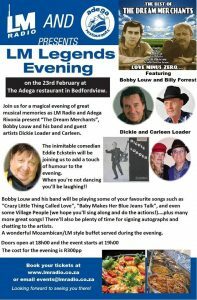 Join us for another fabulous LM Legends evening on the 23rd February at The Adega restaurant in Bedfordview. You can expect a magical evening of great musical memories with “The Dream Merchants” and Dickie and Carleen Loader and Bobby Louw and his band. Bobby and his band will as usual be playing some of your favourite songs such as “Crazy Little Thing Called Love”, “Baby Makes Her Blue Jeans Talk”, and even some Village People (we hope you’ll sing along and do the actions! )….plus many more great songs! There will also be plenty of time for signing autographs and chatting to the artists. There will be a wonderful Mozambican/LM style buffet served during the evening.